If you’re looking for affordable Sun Cellular unlimited call and text promo, try out the new WAIS100 offer. This is part of their WAIS load combo package that gives better value for your money. For only 100 pesos, you can enjoy non-stop texting and calling for 15 days to your circle of friends without worrying the promo validity. What’s good with this offer is that you can only do a one-time registration instead of daily or every 3-days, which is very hassle if you so many things to do every day. This is available to all Sun prepaid subscribers nationwide. You can register directly thru your load retailer or just use the keyword format to subscribe. 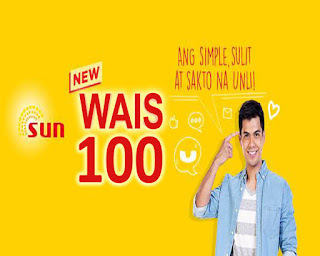 Just text WAIS100 (space) Sun Mobile number (space) 5-digit PIN send to 168. Default pin is 00000. Just directly dial the 11-digit mobile number of the person you are trying to call. You can dial *221# on your phone to know the details of your promo. You can also add unlimited text to all networks, trinet calls, IDD and data for only 50 pesos. Make sure you received the SMS confirmation from Sun Cellular before you start using the promo. You can visit Sun Cellular for other prepaid load promos.